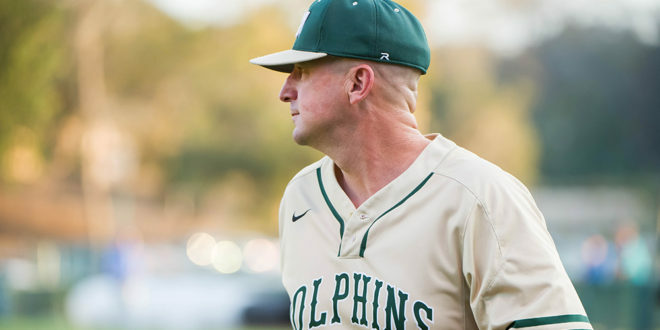 It is there, among the isolation of bats, balls and the prospects of another promising season, that the new Jacksonville University baseball coach makes plans with assistants and a roster of young players to be winners – both on and off the field. From there, he generally has lunch with his wife, Joy, before returning to the school for practice. After that, there is dinner with Joy in one of Jacksonville’s eclectic neighborhoods, before returning home. Every time Hayes’ life has sent him on a detour, he always returns to the “big ol’ small town” that he loves so much. And a big part of that has been, and always will be, JU. “We have a definite niche [at JU]; we have a unique situation that we offer,” said Hayes. “It’s for the guys who love the game, love the fellowship of the game, the brotherhood of the game and who understand we have to take care of business in the classroom and to aspire to be great in the classroom as much as on the field. And maybe prove people wrong. Hayes’ name is all over the Dolphins’ baseball record book. Jacksonville University’s name is embossed on his finance degree and MBA, which he earned from the University in 1995 and 2007, respectively. He had a five-year professional run with the Toronto Blue Jays, and another five as head coach at Seminole State College in Sanford, Fla., before returning as a JU assistant in 2013. An expansive search eventually led JU a few steps across the hall at the baseball complex when Hayes was promoted to the head coach position last year. At the end of the selection process, JU Athletic Director Alex Ricker-Gilbert had no doubt he had his man. And he has no plans to leave again. Hayes played at Englewood High School in Jacksonville before making the short drive down the road to JU. He still credits his high school coach, Jack Spencer, with challenging him to play with as much passion and emotion as skill. His current players say little has changed since. The team has its own special culture, added redshirt-sophomore pitcher Greg Shannahan. Hayes played four years for the Dolphins, where he became one of the team’s most-prolific hitters. He still ranks third with 176 career RBI and 53 doubles; fourth with 12 sacrifice flies and 271 hits; fifth with 802 at-bats, nine triples, 20 hit-by-pitches and 402 total bases; seventh with 216 games played; and ninth with 163 runs scored. He was drafted by the Blue Jays and spent five years in the organization’s minor league system, before being released the day before training camp broke in 2000. Although the Blue Jays offered him a job as a coach in the player development department, Hayes remained determined, if not defiant, to keep playing. When that didn’t work out, he traded his cleats and glove for a suit and tie. Eighteen months in the business world made Hayes realize he was a “baseball junkie” and nothing was going to change that. He got back into baseball as an assistant at Wolfson High School in Jacksonville from 2001 to 2003, and his team won districts in 2002 and 2003 and was ranked 12th nationally after the 2003 season. He returned home to Jacksonville University from 2004 to 2008 to be an assistant for Terry Alexander. After that he had a 125-113-1 record in five seasons at Seminole. But it proved too difficult to be away from his hometown. He came back to JU as an assistant for Tim Montez in 2013. Four years later, he became head coach. Jacksonville has a distinctive culture here, with different personalities in different parts of town, Hayes noted. He enjoys experiencing all of those personalities. And a big part of that has been, and always will be, JU. Which makes another perfect day for Chris Hayes even better.